There is no doubt that all goose hunting blinds have their advantages and their drawbacks, and many hunters like to experiment with designing their own. To build your own goose hunting blinds needs a bit of imagination, an understanding of what works and what doesn’t, plus a good idea of what fools geese and what scares them off. Getting started in building your own goose hunting blinds needs a bit of planning, so start by making some notes and sketches of what you like and what you know that you don’t want. Do you want to lay down or sit up in the blind? Do you wish to have a solid bottom on the blind? Will you need to pack or cart the blind on foot? What materials do you want to use for the blind? How to you wish to have the frame go together? How heavy or light should the blind be? How many people will use the blind? Once you have the basic idea of the size, material and dimensions, your next step in building goose hunting blinds is to actually go out and find the materials. A great idea for cheap and lightweight frame material is inch electrical conduit. This can be bought at any home supply or electrical supply store. It is usually gray, but can be easily spray pointed brown to blend into the surrounds. You may also want to paint in various colors of brown and tan, especially if you are hunting on fields rather than in marsh areas. The next step in getting ready to build your own goose hunting blinds is to find the covering material. Man-made fabrics will be lighter weight, but will also flap more and move more with the wind. This may draw attention to the blind, especially on flat fields and solid surfaces. Heavier, natural fabrics move less, are less shiny, and often are more practical to clean and care for. 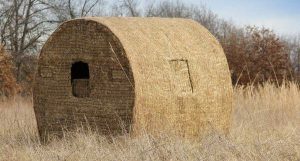 In addition brush or straw can be used to cover the sides of the blind for both additional camouflage and minimization of wind movement on the blind. To actually build your own goose hunting blinds in the field cut 6 lengths of the electrical conduit about 5 feet in length, or roughly in half. These will form three inverted “V” shapes for the sides and top. Two eight to ten foot lengths can be used to support the sides, one down the middle of each of the inverted “V” shapes. The ends will remain open. The blind can be made taller or shorter by spreading out the supporting sides of the “V”s. The conduit is held together in place with wide rubber bands, electrical tape or leather strips. Remember it is only a temporary blind and taking apart and putting up should be simple and easy.